IN THE PAST two weeks, I've been in London and Paris. Along with thousands of other contemporary art aficionados, I went to London for the Frieze art fair and then to Paris for the FIAC art fair. One morning while in Paris, my colleague Xavier Auza and I made a pilgrimage to the Louvre. For Xavier, a first time visitor to Paris, it was an introduction to this great museum, and for me it was an opportunity to revisit cherished old friends, such as Gericault's Raft of the Medusa. After a whirlwind few hours seeking out favorite masterpieces and glimpsing golden hallways that glittered with palatial splendor, we headed for the Grand Palais, the site of FIAC, by way of the Tuileries gardens. 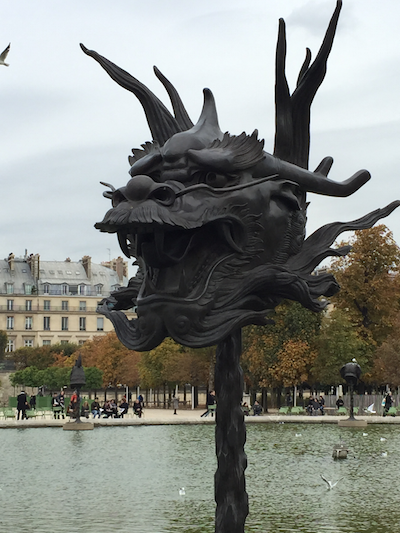 There, I was surprised and delighted to come upon a vast circular pool in which were stationed the twelve sculptural animal heads of Chinese artist Ai Weiwei's Circle of Animals/Zodiac Heads. I'd seen these works before -- installed in New York, in front of the Plaza Hotel, and again in Los Angeles, at the the LA County Museum -- but I'd been distinctly underwhelmed by them. Previously, instead of magnificently present, this sculptural installation felt inert, the heads just sort of stuck in the ground and bereft of their full meaning and menace. Here in the Tuileries, though, after I'd encountered a range of magnificent sculptures of all periods and parts of the globe, I felt was seeing these sculptures for the first time. Poised above the dark waters of the pool and facing outward, Ai Weiwei's powerful zodiac animal spirits seemed to spring to life. Black and beautiful, menacing as well as lyrical, they are lovely works-- icons displaced from what might be considered their original cultural context and yet exactly and correctly situated. They seem to rear out of the waters, so very alive and playful. Even the snake feels right, for the first time-- like he's ominously popping out of a Harry Potter movie. 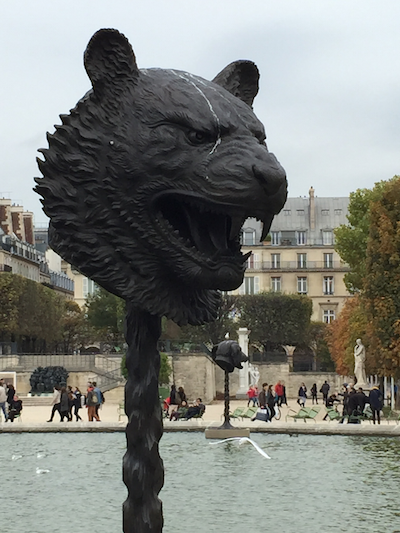 These animal heads are particularly powerful in Paris, where they resonate with the many echoes of their creative history. While at first glance Circle of Animals/Zodiac Heads appears to be only a large, appealing installation that playfully explores the twelve signs of the Chinese zodiac, it is much more than that. This is an epic attempt to grapple with modern China's complicated relationship to its own history, reaching back more than 150 years to a dark period of the country's history. And because of this, it's worth a closer look at the derivation of the Weiwei work. Animal heads like this originally adorned a lavish fountain in the Garden of Perfect Brightness in Beijing. The garden and some of the palaces were built on the European model as part of Yuanming Yuan, an ambitious architectural project whose main purpose was housing the treasures of the Qing Dynasty. The opulent residence of the imperial family was built in the 18th and early 19th centuries. Designed by an Italian Jesuit, the fountain functioned as a water clock and was famed far and wide for its beauty and refined mix of European and Chinese cultures. The fountain was destroyed by British and French troops at the end of the Second Opium War, in 1860, marking the beginning of a period of Chinese history that is often referred to as the century of humiliation. Ransacked and looted, the Garden of Perfect Brightness and the twelve bronze animal heads stand as the most potent symbol of this humiliation. The zodiac heads were looted and, for more than a century, privately traded. When five of the heads (Monkey, Tiger, Bear, Ox and Horse) suddenly appeared at auctions in 1987-2000, the Chinese government laid claim to them as illegally exported national treasures of great symbolic value. The five heads were all bought by Chinese buyers and are stored at The China Poly Group. A scandal ensued in 2009 when the estate of Yves St. Laurent put up the Rat and the Rabbit for auction at Christie's in Paris, at an estimate of 13 million US dollars each. The Chinese government tried to stop the sale, but a court ruled against them, chilling diplomatic relations between China and France. A private French collector later bought the two animal heads and donated them to The China Poly Group. In reinterpreting these objects, Ai Weiwei's Circle of Animals/Zodiac Heads focuses attention on questions of looting and repatriation, while extending his ongoing exploration of the "fake" and the copy in relation to the original. Ai Weiwei has made two versions of Circle of Animals/Zodiac Heads -- one in bronze with oversized heads, intended for outdoor display and a more lifelike one, in gold, for museum display. Both versions have toured extensively, and speak eloquently both of an individual human being and vast cultural forces: created by an Italian in China and looted by a European army, highly-charged historical objects are recreated by a Chinese artist who is censored in his own country. One of China's leading conceptual artists, Ai Weiwei is known for his social or performance-based interventions as well as object-based artworks. Citing Marcel Duchamp, he refers to himself as a "readymade," merging his life and art in order to advocate both the freedoms and responsibilities of individuals. "From a very young age I started to sense that an individual has to set an example in society," Ai has said. "Your own acts and behavior tell the world who you are and at the same time what kind of society you think it should be." Ai Weiwei ranks among the absolute elite of the art world. Circle of Animals/Zodiac Heads is one of his most talked-about art works. Once reserved for the eyes of the privileged few, these animal heads have been seen so far by millions of people in North America and Europe--and they will be on view in Paris through December 21. For more information go here.